Gooey marshmallow-topped sweet potatoes are a standard on many Thanksgiving tables. 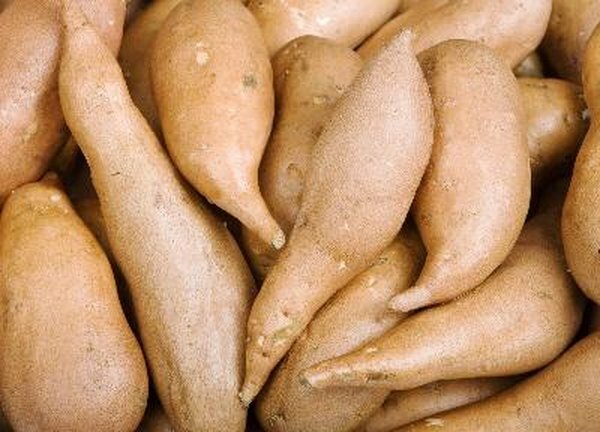 Alone, sweet potatoes are a source of vitamin A, fiber and potassium. Their natural sweetness makes them appealing to both kid and adult palates. Next time you make mashed sweet potatoes, leave off the sugar to make them a healthy addition to your dinner table. In 1 cup of plain, mashed sweet potatoes, you get 249 calories and no fat. A cup of mashed sweet potatoes provides well over 1,000 percent of your daily vitamin A needs and more than two-thirds of your daily requirements for vitamin C. A cup of mashed sweet potatoes also provides 3.1 milligrams of vitamin E, 6.9 micrograms of vitamin K and 0.5 milligrams of vitamin B-6. One cup of mashed sweet potatoes contains more potassium than a banana and offer 2.4 milligrams of iron along with 87 milligrams of calcium. Sweet potatoes are also a source of a number of essential trace minerals such as magnesium and phosphorus. One cup of mashed sweet potatoes offers 8 grams of fiber. Women should strive to consume at least 25 grams of fiber daily, according to Institute of Medicine guidelines, so that cup is about one-third of your daily requirement. Fiber helps move food through your digestive tract, preventing uncomfortable bloating and constipation. Fiber also plays a role in protecting the overall health of your colon and may help lower your cholesterol, contributing to a decreased risk of heart disease. Adding butter, brown sugar and marshmallows to mashed sweet potatoes diminishes their healthy benefits. One cup of mashed sweet potatoes that includes 1 tablespoon of butter, 1/4-cup of marshmallows and 2 teaspoons. of brown sugar contains 174 more calories and 11 grams more fat than plain mashed sweet potatoes. Adorned mashed sweet potatoes also have at least 15 grams of added sugar. Sweet potatoes are naturally sweet, so they do not need added sugars. If you want to enhance your plain sweet potatoes, try mashing in sautéed shallots, chopped fresh rosemary, olive oil, cracked black pepper and sea salt. Add ginger, olive oil and lime juice for mashed sweet potatoes with a spicy bite that work well as an accompaniment to an Asian-style stir fry. For a holiday feast, add a little olive oil, dried cherries and toasted pecans to your mashed sweet potatoes.